Tried Tested Trusted. Aimed at women who are looking to find quality and value in every aspect of their lives, Good Housekeeping and Afrikaans edition, Goeie Huishouding, offer them tried and trusted content that will inspire all areas of their busy lives from health and wellness to food and fitness, beauty and home to personal style and parenting. 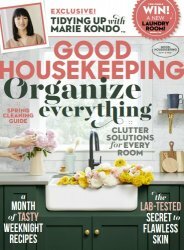 Good Housekeeping’s editorial promise is to offer ‘tried, tested and trusted’ content, underpinned by the Good Housekeeping Seal of Approval. Please note: this digital version of the magazine does not include the covermount items you would find on printed newsstand copies.